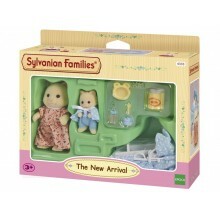 Meet Baby Jacque Chantilly, Sylvania's new arrival! 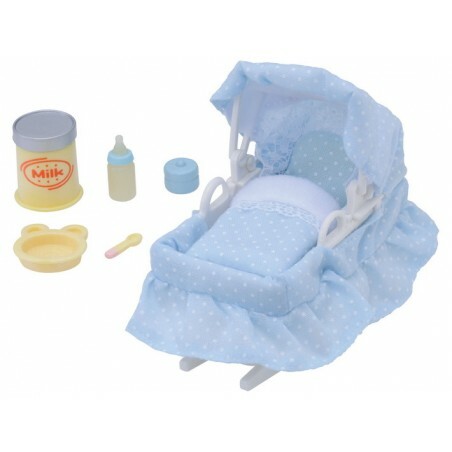 The New Arrival set includes the essentials Jacque should need, including a beautiful blue and polka-dot rocking crib, a pot of milk powder, a feeding bottle, a baby bowl and spoon. Not an experienced parent? Don't fret, Mother Myriam Chantilly can look after the little one. Jacque Chantilly comes adorably dressed in a blue baby-grow and cape, Mother Myriam Chantilly in a lovely pink frock. This set includes Myriam Chantilly and Jacque Chantilly.